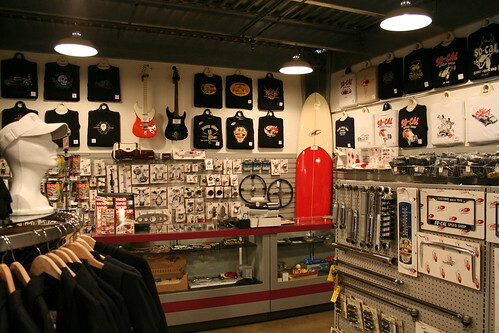 From the time you enter the retail store for So-Cal Speed Shop you know you are some place special. 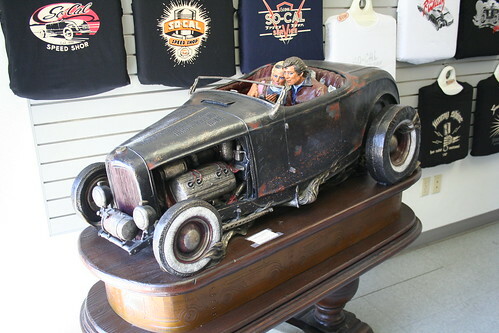 It is an eclectic mix of hot rod parts, clothes, books, art, $150,000 hot rod sculptures too coffee cups. From here the tour moves to the three shop areas. The first has some wonderful vehicles under construction. Every car has its own build area and its own builder; one car, one guy. If you have the skill set it has to be a dream job and if it was my car getting built I would want to get to know that builder real well. When he is done he will know ever nut and bolt personally. Some of us don’t have the time or skills to build our own car from the ground up and some of us don’t have the $150,000 to have someone else build it, but I envy either kind of people who do. In the second building we found a car Jimmy Shine is building and some other special vehicles like the Chevy HHR that is being built to do 250 mph at Bonneville. Last year a similar HHR from So-Cal’s shop hit 149 before it wrecked. Now, they have learned more and are building a new and faster car. Look for this car at Bonneville next year. Like Billy Gibbons of ZZ Top? Think he is all about hot rods and music? 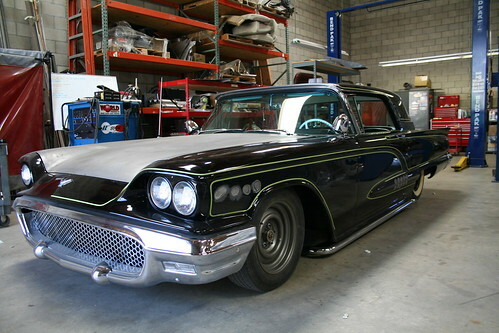 How about this cool TBird that So-Cal is building for him to drive around CA? Look how good it looks with that flat hood. Everyone else puts scoops on hoods, takes a real man to cut one off! The third shop has more race cars and some other cool stuff. How about the famous Belly Tanker without a skin? This car just returned from being on display in Europe and suffered some damage in shipping. It is now getting freshened for the next adventure. To see more on this car go to our Feature Car Page. If you want to see more of the So-Cal Speed Shop tour go to our On Tour Page. The guys at So-Cal Speed Shop are fantastic for letting gearheads like me get inside their ceremonial grounds. The best part? It is all free and anyone can take the tour. Just show up at the appropriate times and you to get to see the inside. Make sure you thank them, this is a rare and wonderful experience. 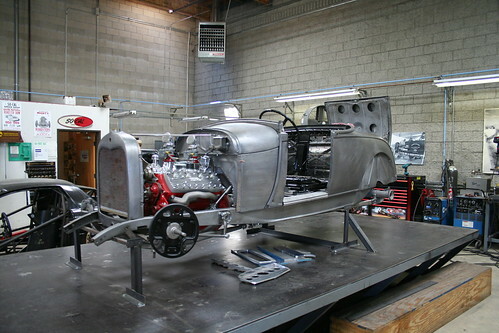 So-Cal Speed Shop's Historical Belly Tanker Stripped Naked!